Today’s entry is our first guest blog. It follows naturally from the last entry on how our eyes scan and sample images. Tim Smith is a psychological researcher particularly interested in how movie viewers watch. You can follow his work on his blog Continuity Boy and his research site. At the Broadcast Video Expo in London on February 15, Avid introduced a significant new version for its Media Composer, NewsCutter and Symphony, which will be available March 8. Media Composer version 5.5, NewsCutter version 9.5 and Symphony version 5.5 feature increased support for third-party hardware, more in-the-box functionality and an increased collaborative workflow. This is the 25th annual, or 76th annual, "this is the year of HDTV." Nielsen says 56% households have HDTVs, but only a fraction of viewing is HDTV, mostly sports. AP: "The Pope is going HD". Still no HD press bridges / pool feeds. Super Bowl forst show not shoot-and-protect for 4x3; was 16x9 HD all the way. Editing is story-telling. While we can all agree with that, that sentence isn’t particularly helpful. 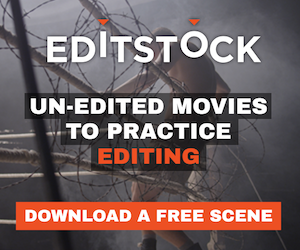 What editing is actually doing is telling your story by juxtaposing different shots so that your audience sees, hears, and feels what you want them to feel. Quick Avid Tip: Rename your MXF folders! Smith Micro Software, Inc. Productivity and Graphics Group, announced the availability of Poser Debut. Poser Debut allows users to create scenes and add, pose and animate 3D characters. Users can master 3D art and animation with the easy to follow, step-by-step Project Guide. This week’s episode of the world’s only interactive talk radio program covering Digital Production, Post-Production and Distribution is filled with information and entertainment designed for the independent filmmaker or industry professional.